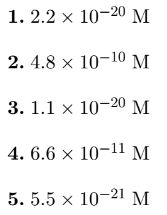 Solution: What is the minimum S2− concentration that will cause ZnS to start precipitating from a 0.10 M solution of Zn(NO3)2, a very soluble salt? Ksp for ZnS is 1.1 × 10−21. What is the minimum S2− concentration that will cause ZnS to start precipitating from a 0.10 M solution of Zn(NO3)2, a very soluble salt? Ksp for ZnS is 1.1 × 10−21.